I hope you all had a fabulous New Year — Welcome to 2011! 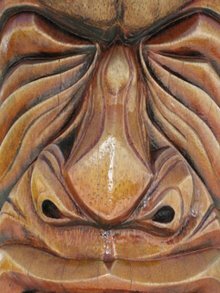 I've been suffering with a very nasty cold since before Christmas and because of it I missed out on a few things I had planned for after the holidays. I had to cancel my plans to meet my friend Bunny of Paris House Designs and her cutie pie son Oliver, who is a six-year-old blogger. We were supposed to meet in Orlando where they were vacationing and I was looking forward to spending time with their family. Big time disappointment! Since the few hours I spent with my sister and my daughter for Christmas, the only thing I'd seen was my computer screen and the television screen. The walls were starting to close in and I was definitely going a bit stir-crazy. The crazy part is what probably led to my decision on Saturday night/Sunday morning to crawl out of bed at 2:30am and hit the beach at 3:00am for a -0.82 tide. The weather was going to be in the mild mid-fifties and warm up to the mid-70s with only a 30% chance of a little rain. I didn't think it could make me any sicker, figured the fresh air would do me good and I knew there wouldn't be anyone else around to pass my germs to. Besides, seeing all the shells my friends down in Sanibel and Venice have been finding washed ashore, I had to see what was happening on our part of the Gulf Coast. I donned a warm sweater, a knitted cap, tennis shoes and my headlamp. Oh, and I brought along some Kleenex and cough drops. Well, to say there was not a lot to be found is an understatement. I walked several miles up the shore and found nothing in the intertidal or the subtidal zones. I mean that literally, I picked up nothing. 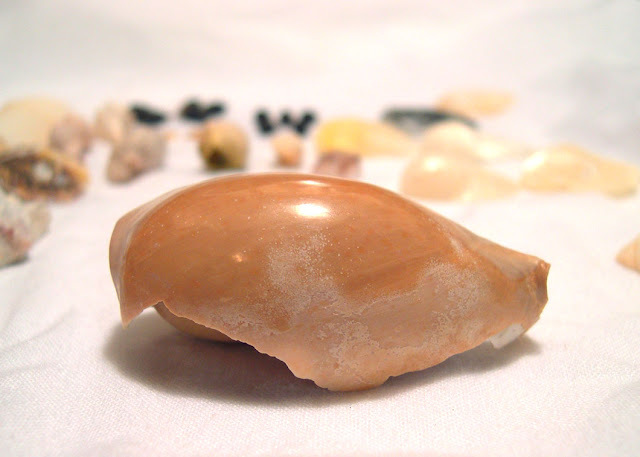 Even common shells that are usually numerous, were not there. No scallops, no tulips, no coquinas, no cockles, no kittenpaws, no nothing. Disappointed, I decided to walk along the seaweed line. That line usually separates the intertidal and the supratidal zones. I found one other thing, but I'll tell you about that later. 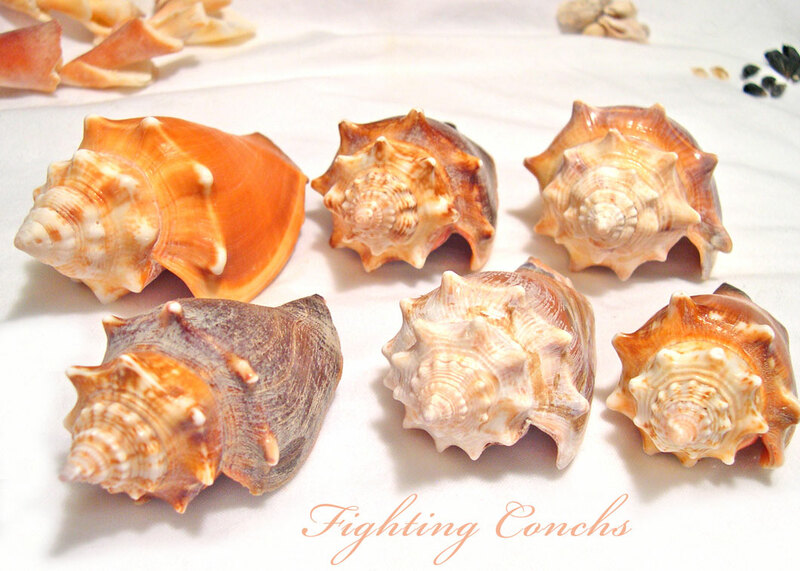 Other than these six gorgeous, unbroken Fighting Conchs, Indian Rocks Beach was not giving up anything else that morning. I headed back to the car, grabbed my chair and spent the next hour or so just sitting and reflecting on life. The gently lapping of the waves was soothing to my soul and I was happy to be there in the dark without another human in sight. Fully relaxed and feeling pretty good, I decided to head over to Dunedin Causeway to see what the low tide was revealing. I would also be positioned in a great area to watch the sunrise over the water. Here on the Gulf Coast, we have spectacular sunsets, but few people know you can go out on one of the barrier islands, turn around and greet the dawn. 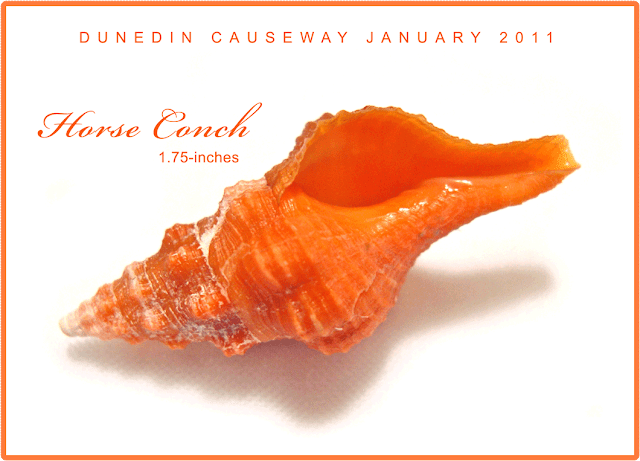 The Horse Conch was designated the official shell of Florida in 1969 and a favorite of many shellers, myself included. I have itty bitty ones and some that are very large. They can grow to be as long as 24-inches and I love them in any size or condition. This one is just perfect! You can see I didn't pick up much, but those that I did were very nice specimens. I was still surprised I didn't find scallops, they are so common and I need some for a project I'm working on. There was one, but it was a "hitchhiker". When you're shelling you have to be very careful that some living thing isn't hiding in a larger shell you've picked up. 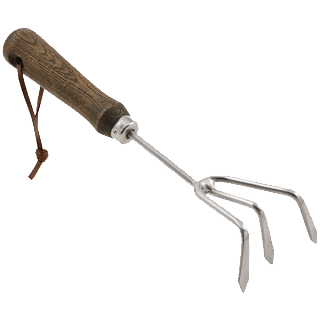 Usually I find little crabs scurrying about in my bag and I have to make a quick trip back down to the water to release them. Unfortunately, this scallop was so tiny, that it escaped my attention and almost went down the drain when I was cleaning my shells. Sorry little guy, I'm an old woman with poor eyesight and you were in the wrong place at the wrong time. 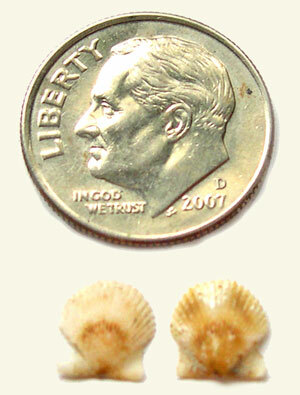 However, it does take the distinguished honor of being the tiniest intact scallop to ever grace my collection. I also picked up a few broken shells and share them with you here in the hope that some of my shelling buddies can help me identify them. For now I call them the Whatzits? Neither are familiar to me, so I assume they are uncommon on my beaches. Any ideas? 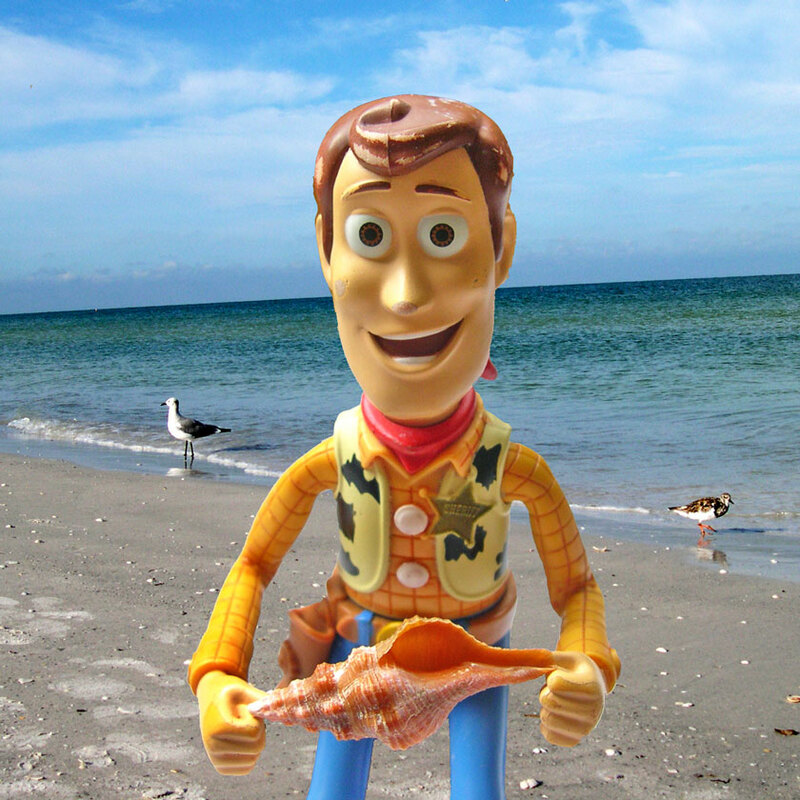 Plastics in our oceans are never a good thing, so I'm thankful Sheriff Woody of Toy Story fame ended up in my shell bucket and not floating out in the Gulf, where he could do a lot of damage to our environment or left on the shore where some curious bird might decide to make him breakfast. I think Woody was pretty happy about that also. 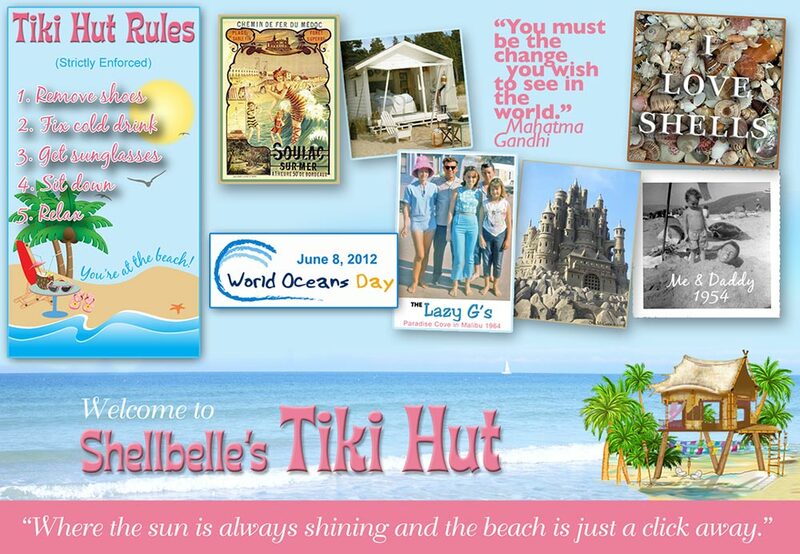 "Hey kids, I was so happy that Shellbelle rescued me from that pile of seaweed, but I lost my hat and my gun. I certainly hope they don't end up in the stomach of a sea turtle or a beach bird. I wanted to tell you today that taking toys like me to the beach is not a good thing. I'm much prefer the safe environment of your bedroom, than I do being tossed around in the waves. Just like my pal Nemo would be like a fish out of water on the range, I don't belong in the sand. 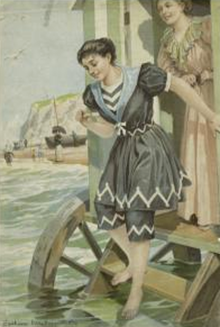 So the next time your mommy and daddy take you to the beach, be sure to leave me behind. Don't worry, I've got lots of friends to play with while your gone and you know from seeing my movies, that we're never bored while your off having a grand time at the shore." Thanks Woody! We loved having a big Hollywood star help us to spread the word on protecting our oceans and sealife. After I had safely stashed the day's finding in the back of the car, I pulled out my camera just as the sun was starting to rise, but I've gone on long enough today, so I'll share those pics with you on Friday. I will tell you that it was S P E C T A C U L A R. Seriously, I do believe it was the best sunrise I've ever seen and I captured it on my little camera to share with you. Until then my dear, sweet friends, I wish you all the best and hope that wherever you are and whatever you're doing, your enjoying life! I'm still nursing my cold, but it's no better or worse for taking the time to enjoy the great outdoors. Lesson learned. Catching up with all my friends today.....Happy New Year and I love the Woody PSA! I was right beside you every step of the way!! I love Woody he so cute and I love the shells, I really like conch shells a lot. I learned a little about them at a shark feeding we went to in Florida . Oliver is doing better and we are hoping to meet you soon, that would be great if Sheila could join us and I can bring my mom too!! Sorry to hear you are still battling that cold. 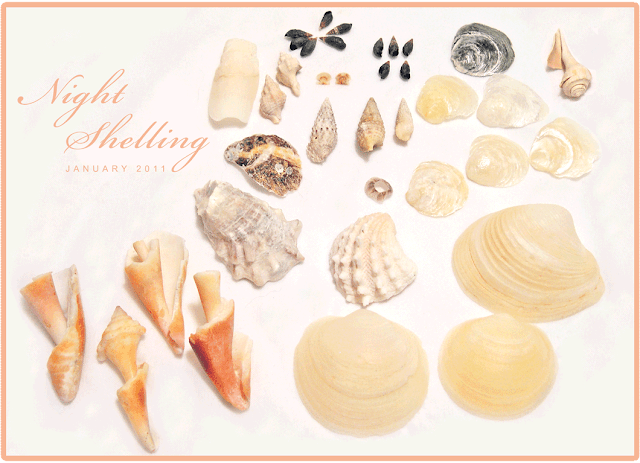 I am glad it hasn't stopped you from enjoying your shelling adventures though! You have some wonderful finds. I like the Lightening Whelk. I think I find pieces of this often on our beaches but have never seen one intact. It's very pretty! Your PSA w/Woody is so cute! 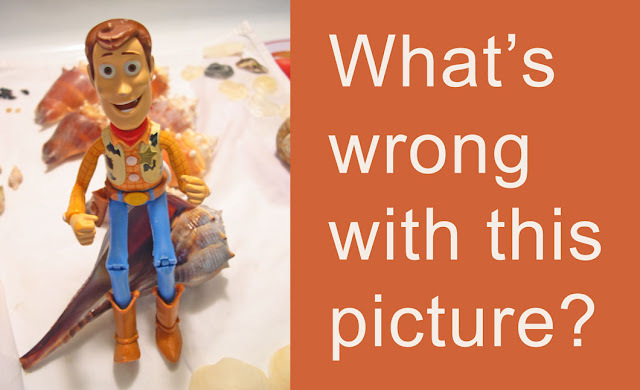 I know you are serious and passionate about this but come on, he looks just so adorably "Woody" there holding the shell. LOL! I can just hear his voice too! :)) Hope you get well soon! Rhonda, I'm so glad that you bit the bullet and did this. I still haven't ventured out, and it's been three weeks. This thing is BAD. Loved all the shells you found, and I loved the PSA! Sending you big hugs and all my love. Hoping we can get together before our next birthday! LOL! Oh, how I miss Honeymoon Island. 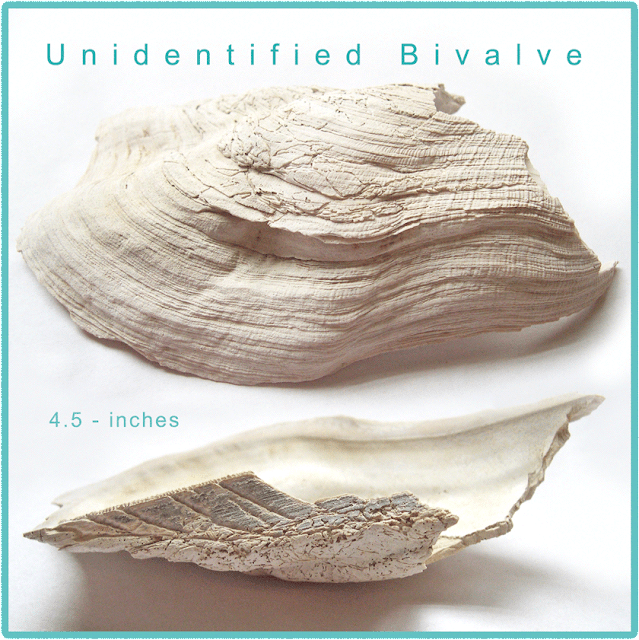 The bivalve looks like a worn down oyster to me. That horsie is the bomb! 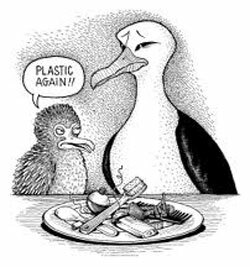 I swear Rhonda, you should be writing kid's books because if every kid could read your little Woody story we would defineately nip littering in the bud. You rock....whoops I mean You Shell! 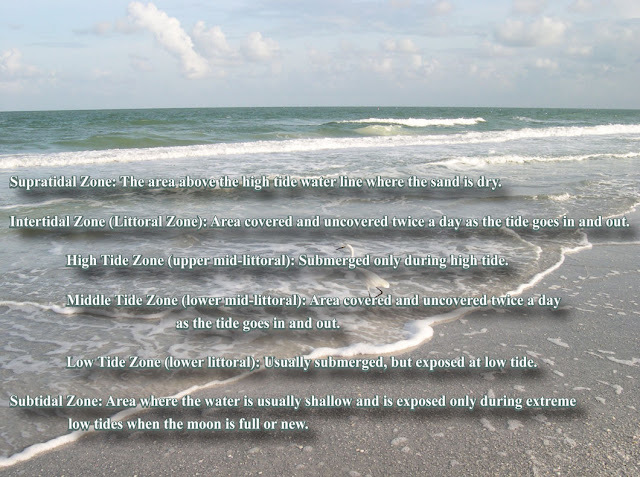 I thought I was the only one who looked at tides that closely:) BTW-Your pics look a little wacky in the blog. Could be my internet browser, though. I shouldn't laugh as the message is important.. but he looks so darn cute!! I was thinking of you yesterday when I was picking up shells along the beach.. nothing lovely like you found.. but beach memorabilia just the same!! I have some little plastic toys I have kept.. that I found years ago.. in second hand furniture purchases etc.. I still have them and treasure them... seems that are good luck I think, so hope Woody brings you good luck too!! Sorry you are still battling the cold...not fun! Looks like you found some good specimens on your latest venture. (I found a lot of scallops in Venice last week...in just a few minutes.) Woody's PSA is so good. I think Kaybe is on to something...you should consider writing a children's book. Get better soon! 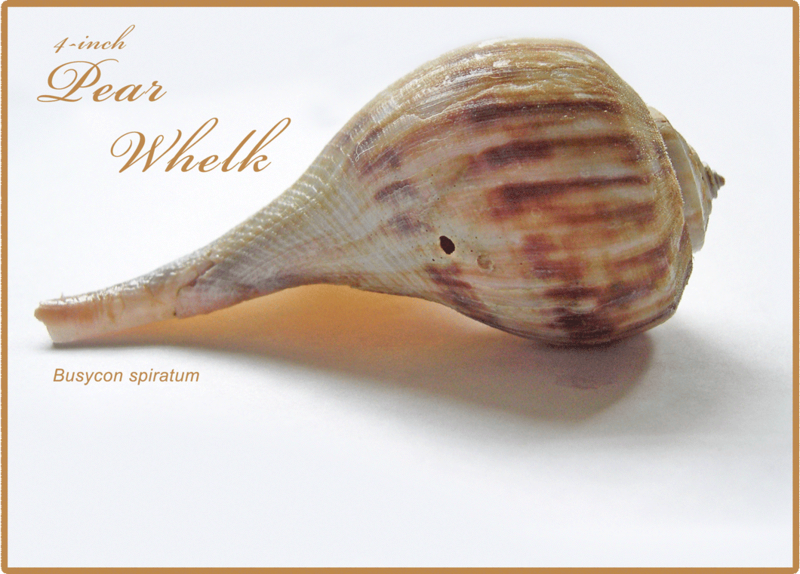 and happy shelling. If misery loves company, I'm in the third week of nursing a rotten cold. 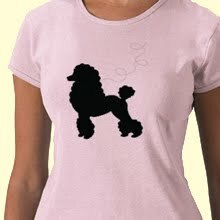 Even when I get rid of mine, Husband has one going, so believe me, I'll still be nursing one! This post was so informative! Thanks for all the good information. And taking a cultivator along...who'd have thunk it! I always pick up the plastic, too. So damn cool!! Just the idea that you went out in the middle of the night to go shelling? Now, that's a diehard!! 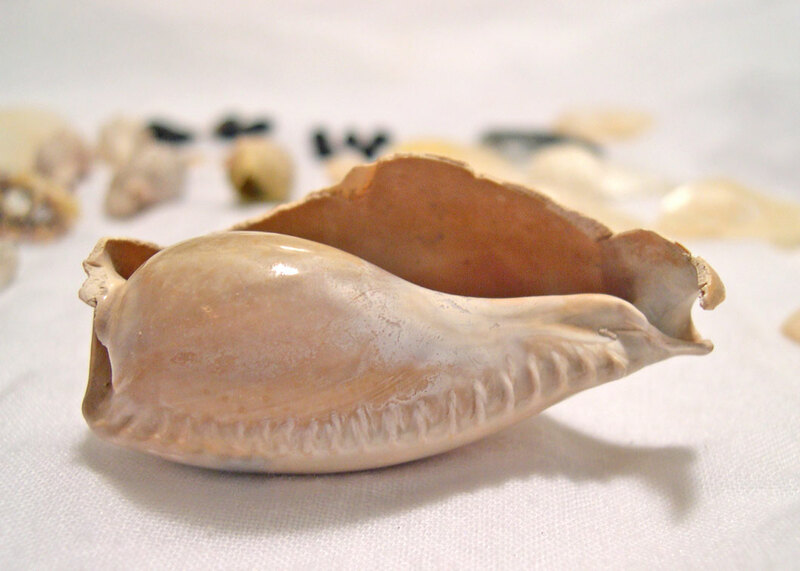 Love your stories and would KILL to see so many shells in one place. Man, oh man....I cannot wait!! 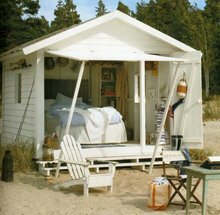 and the thought of just sitting on the beach, with no one else in sight, reflecting on life? Well, that is just SO cool!! And I think all that fresh air may have just cured your ails!!! Great pic of Woody and his story...very clever ms. SB!!! 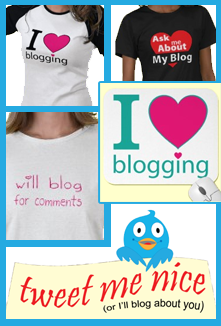 I love your post! Beautiful pictures. I also love FL. The shells you found I found some when we were in St. Augustine. Don't know what they are, haven't looked them up yet. Where are you living now? Glorious new years wishes to you ~! What treasures you have found! I love Woody's PSA! Great job! 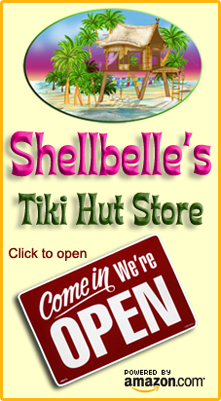 One of these days I am going to tag along with you when you go shelling! I loved my 'virtual' shelling with you today Rhonda. You found some beautiful shells. I can't wait for April. After all the snow we have had recently here April can't come soon enough! hugs and FELIZ AÑO NUEVO!!! Piano Update and a BIG Thank You! 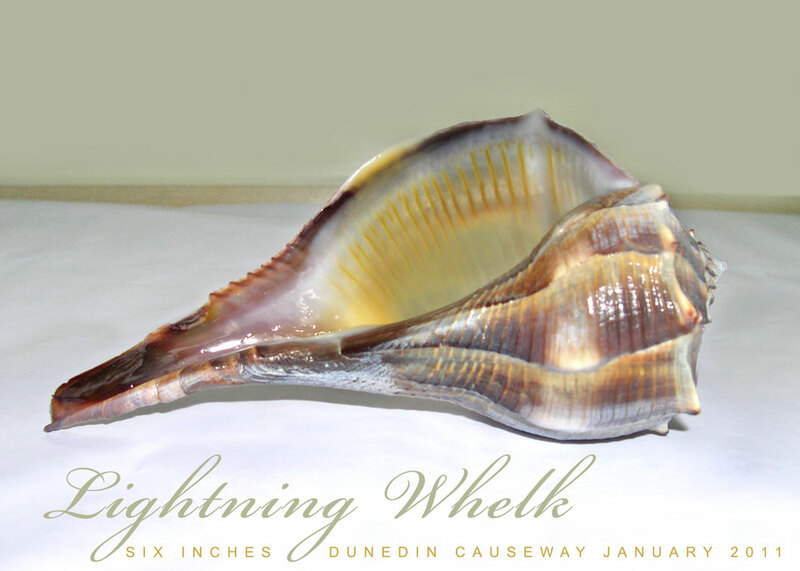 The Biggest Shell in The World! Game Time and I'm not talking football!